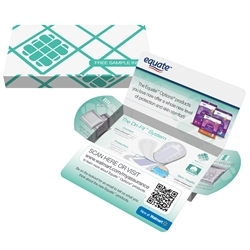 Get your Free Sample Kit of Equate Pad and Liner Kit. Order your sample kit from their page and you’ll receive a kit which includes 1 very Light Long Liner, Moderate Long Bladder Control Pad and Maximum Long Bladder Control Pad. Product samples available while supplies last. Please allow 6-8 weeks delivery of your sample. This offer is open to US residents aged 18 years or over only.